The beaches of Tropea, a seaside resort off the coast of the region of Calabria in the Southern Tyrrhenian, are renowned for their beauty and for the clearness of the waters they face. Small wonder they attract tourism in general but also the boating world in particular. One of the strong points in favour of this resort, is its strategic positioning as the glorious Eolian Islands and the Straits of Messina lie only 30 miles away and the airports of Lamezia Terme and Reggio Calabria stand at a short distance. Tropea is served by a motorway and has a railway station making connections very easy. 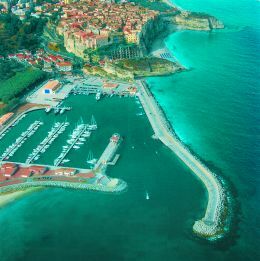 Those reaching Tropea by sea, will find a modern marina situated in the heart of the Riviera able to host yachts of up to 50 metres. The harbour boasts 620 births and a minimum draught of three metres, moorings with water and electricity supply points (220 and 380 V), all made available through an electronic key device. The structure offers top facilities to make its guests welcome and comfortable, such as a number of toilet facilities commensurate to the harbour's guest capacity, internet points, fax services, weather forecasts, manned parking areas, a hire service for cars, scooters, out-boards, sailing and engine powered boats, shops, restaurants, and finally an open air theatre with plenty of shows during the season. Other services obtainable within the harbour structure include fuel supply, p/o boxes, use of a club house, refuse collection, technical assistance such as launching and beaching services, careening, toxic water conditioning. The adjoining Tropea Harbour Shipyard - MEAM - offers all kinds of general and specific maintenance services and is equipped with a 50T. travel lift complete with small crane for sailing boats, a 40T. self-moving launching cradle, a 10T. self-moving crane, a 150T. slipway trolley and a slipway for boats on trolleys. The Shipyard will also collect any refuse including used oil and batteries, and can dispose of covered space for winter dry-docking, as well as workshops for any mechanical and electrical repairs. Thanks to its geographical position and its capacity and services offered, the harbour of Tropea is certainly a reference point for those cruising the Southern Tyrrhenian seas, but also for those wishing to visit the Eolian Islands knowing that they can count on a fully equipped structure able to solve any difficulty very near by.